Cadaveric donors with congenital renal anomalies are often refused because of technical difficulties. As the waiting periods for kidney transplants continue to increase, transplant centers need to consider them also as potential donors. This paper describes transplantation of a crossed fused disc type ectopic kidney to two patients with end-stage renal disease, after parenchymal transection. The transplants were successful with minimal complications, and the recipients had immediate graft function. It is now one year from transplantation, with excellent renal functions. Renal ectopia describes the failure of kidneys to ascend and cross the midline during development, resulting in the ipsilateral position of both kidneys. Crossed renal ectopia is a rare (1 in 1000 live births) congenital anomaly, in which both renal masses are located on the same side of the abdomen and are fused in 90% of cases. This condition is not usually associated with renal pathologies and is asymptomatic though the vascular anatomy is commonly complex. Therefore, in the past, kidneys with congenital abnormalities have been been often refused for transplantation because of the increased risk for surgical problems and complications. However, despite a high rate of vascular and ureteral anomalies, at present, there are some reports of these kidneys being used in renal transplantation. Because of the ever-increasing demand for kidney transplantation and the ensuing long waiting periods, nowadays, centers have started using kidneys with congenital abnormalities. Horseshoe kidneys are now increasingly used for transplantation, either as a whole or a split graft. This paper describes the transplantation of a cadaveric crossed fused disc type ectopic kidney to two patients with end-stage renal disease. The transplant recipients were 27 and 25-year-old females selected from our transplantation waiting list. Both of them had a history of previous kidney transplantation six and seven years ago, respectively. They came back to dialysis five and six years after transplantation, respectively (because of chronic rejection). They had undergone a full evaluation and were approved and listed in the waiting list for kidney re-transplantation. At the time of transplantation, her panel of reactive antigen was below 10%. We opened both of recipients before harvesting due to normal sonographic report and normal renal function in donor. The cadaveric donor was a 27-year-old male with head trauma. He did not have any significant past medical or surgical history. There was no history of renal calculi or recurrent urinary tract infections. The donor family was not aware of his congenital renal anomaly, and the patient did not have other congenital anomalies. The cadaveric donor was hemo-dynamically stable with good urine output, and the serum creatinine was 1.3 at the time of donation. After laparotomy through a midline incision, we encountered a renal mass located only on the left side of the lower abdomen. Both kidneys were fused in the form of a disc type crossed ectopia located in left pelvic fossa [Figure 1]. After harvesting the liver, the kidneys were procured en bloc, with the whole of adjacent segment of inferior vena cava and aorta. Each kidney had two arteries and two veins. Figure 1: Disc type crossed ectopic kidney located in the left pelvic fossa. After instillation of dye through the kidney arteries while cool saline washing being performed, the avascular outlines were identified for parenchymal dissection. With instillation of dye into the pyelocaliceal system, we defined the outline for dissecting renal collecting system. The back table dissection and paren-chymal transection were performed, and each of them was transplanted to one of the recipients. The right kidney was split from the left while carefully transecting the isthmus using sharp dissection. A few vessels were suture ligated with Vicryl sutures [Figure 2]. Next, the transection plane and the opened pelvis of left kidney were closed using interrupted 0 Vicryl mattress sutures. Surgicel was used to prevent bleeding and any cut through of the sutures through the parenchyma [Figure 3]. Both the arteries and veins were cleaned of surrounding neurolymphatic tissues. Figure 2: Back table splitting of kidneys before transplantation. Figure 3: The transection plan and the opened pelvis of the left kidney. The transplantation was then completed in the standard fashion. We performed four vascular anastomoses for each recipient (two arteries and two veins). The kidneys were anastomosed to the external iliac artery and vein on the left side. On reperfusion, the kidneys perfused well without any significant bleeding. Both repaired kidneys had single ureter which was anastomosed to the recipient’s bladder after inserting a 4.7 F double J stent. There was immediate diuresis in both recipients and no significant problem perioperatively. They were discharged from hospital on 7th postoperative day. It is now 24 months from the time of transplantation with normal renal graft functions (creatinine lower than 1.5 and creatinine clearances more than 60). One patient had lymphocele one month after transplantation which was refractory to conservative managements and treated surgically with peritoneal window opening. The other patient had pelvicutaneous fistula treated successfully with open surgery covered by omental flap and inserting another double J stent [Figure 4]. 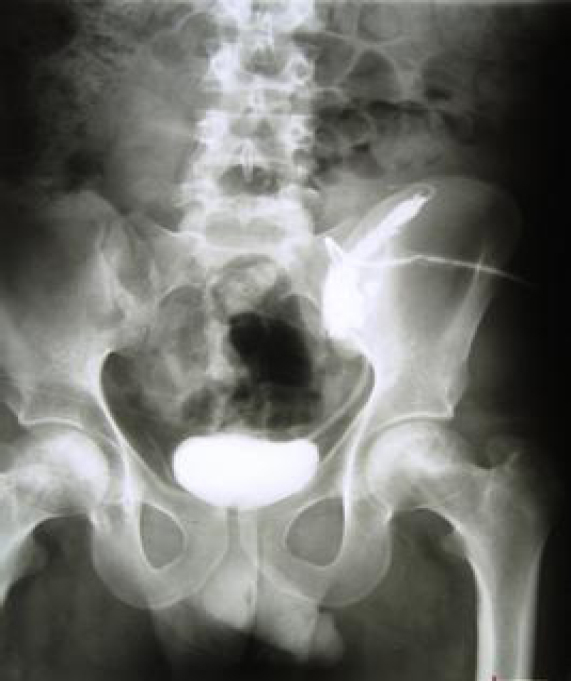 Figure 4: Pelvicutaneous fistula was treated successfully with open surgery and insertion of another double J catheter. In spite of the complex renal anatomy of this anomaly, the course of the patient’s transplantation and postoperative convalescence were only minimally complicated and resulted in excellent long-term graft function. Due to increased demand and long waiting lists for kidney transplants, transplant centers have become encouraged in using selected kidneys with congenital abnormalities and potential donor kidneys such as en bloc pediatric kidneys, kidneys with acute renal failure, and two extended donor criteria kidneys in a single recipient.,, Horseshoe kidneys are now routinely used as both dual and split single transplants, with very good results. Congenital renal fusion anomalies are seen in 1 in 250 autopsies, with horseshoe kidney being the most common anomaly present in 1 to 600–800 adults. Renal ectopia has an incidence of 1/500–1200, and the ectopic kidney can be located from the pelvis (most common) to the thorax. The combination of ectopia and fusion can be found at an incidence of 1/1000 and is termed crossed fused renal ectopia (CFRE). Although there are six types of CFRE, the aberrant kidney is most often located inferior to the normally positioned kidney, and fusion occurs between the superior pole of the ectopic kidney to the inferior pole of the normal one. Most patients are asymptomatic and diagnosed at autopsies or incidentally by imaging done for other indications. Kidney transplantation using donors with crossed renal ectopia has been described. CFRE may be diagnosed preoperatively on routine imaging, but in cadaveric donors, usually only at the time of surgery. Familiarity with the potential anatomic anomalies associated with CRFE is essential to prevent injury to the kidneys at the time of procurement. More than 70% of CRFE have multiple arteries and multiple veins are also common. It is optimal for the kidneys to be procured en bloc and transected at the recipient transplant center. More than 90% of patients with CRFE have two ureters. Unlike with horseshoe kidneys where the ureters are located anteriorly in a normal anatomic position, ureters from the crossed fused ectopic kidney cross over the midline to the left side to enter in the bladder in a normal anatomic position, then care must be taken to avoid ureteral transection during dissection. Investigation of the kidneys should be on the back table to consider for possible split. Obviously, obtaining two grafts is preferable to using one, but it may not be possible secondary to anatomic anomalies. Both the aberrant and normally positioned kidney can have variant arterial supply from the upper abdominal aorta, lower aorta, and iliac arteries. Venous anatomy can also be complex. If multiple renal veins are encountered during routine transplantation, most surgeons routinely ligate smaller renal veins without affecting the outflow of the kidney. However, in these cases, there may not be collateral venous drainage between the two kidneys and anastomosis of even smaller veins may be necessary to prevent venous hypertension. Horseshoe kidneys and CFRE are separated by a tissue band named isthmus, which ranges from a thin fibrous isthmus to thick functional parenchyma and may have to use the techniques of partial nephrectomies. This includes sharp transection followed by the use of the tissue link or cautery for hemostasis, as well as direct locking suture ligature of the stump. In addition, the use of hemostatic glues and materials such as surgicel can be used to secure hemostasis and prevent urine leakage. If the bridge of tissue is too thick to allow safe transection, the kidney can be transplanted as a single graft or en bloc. In this case, the isthmus was thick and parenchymal; thus, we use surgicell at transected surfaces for optimal hemostasis. The last consideration is that the CFRE kidney may be difficult to position due to the vascular reconstruction and increased renal mass, requiring intraperitoneal positioning of graft. In our case, the kidneys were placed extraperitoneal, and there were not any such problems. Due to the ever-increasing demand requests and long waiting lists for kidney transplantation, patients with abnormal kidneys should be considered as potential organ donors. Anomalies such as CFRE should not be considered a contraindication to transplantation. However, the kidneys must be both procured and transplanted with careful attention to the abnormal vascular and ureteral anatomy, which should be assessed by proper studies before surgery. 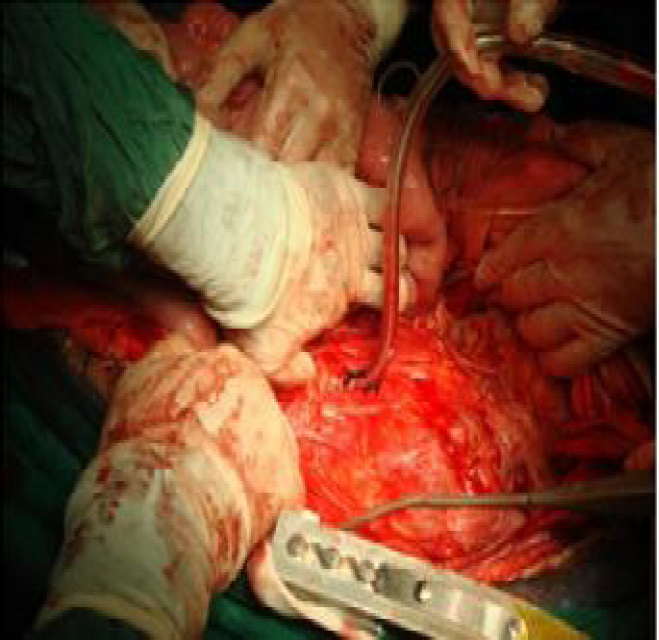 Due to difficulties in dissection, one can offer en bloc transplantation of the abnormal. Surgeons should be familiar with these anomalies and their anatomic abnormalities to ensure a safe transplantation. Long-term graft survival can be similar with normal kidney transplants. Sallami S, Ben Nasr K, Belghith O, et al. An incidental finding of a crossed fused renal ectopia. Tunis Med 2015;93(7):481. Mekeel KL, Daley SM, Andrews PE, et al. Successful transplantation of a split crossed fused ectopic kidney into a patient with end-stage renal disease. J Transplant 2010;2010: 383972. Keitel E, Fasolo LR, D’Avila AR, et al. Results of en bloc renal transplants of pediatric deceased donors into adult recipients. Transplant Proc 2007;39: 441-2. Salifu MO, Norin AJ, O'Mahony C, et al. Long-term outcomes of dual kidney transplantation a single center experience. Clin Transplant 2009; 23:400-6. Stroosma OB, Scheltinga MR, Stubenitsky BM, Kootstra G. Horseshoe kidney transplantation: An overview. Clin Transplant 2000;14: 515-9. Dinckan A, Tekin A, Turkyilmaz S, et al. Horseshoe kidney for transplant: Report of 3 cases. Exp Clin Transplant 2007;5:716-9. Boyan N, Kubat H, Uzum A. Crossed renal ectopia with fusion: Report of two patients. Clin Anat 2007;20:699-702. Singer A, Simmons MZ, Maldjian PD. Spectrum of congenital renal anomalies presenting in adulthood. Clin Imaging 2008;32:183-91.
de Virgilio C, Gloviczki P, Cherry KJ, et al. Renal artery anomalies in patients with horseshoe or ectopic kidneys: The challenge of aortic reconstruction. Cardiovasc Surg 19953: 413-20. Breda A, Stepanian SV, Lam JS, et al. Use of haemostatic agents and glues during laparoscopic partial nephrectomy: A multi-institutional survey from the United States and Europe of 1347 cases. Eur Urol 2007;52:798-803.